Bamboo – An Answer to Deforestation or Not in Africa? HARARE, Feb 28 2015 (IPS) - Deforestation is haunting the African continent as industrial growth paves over public commons and puts more hectares into private hands. According to the Environmental News Network, a web-based resource, Africa loses forest cover equal to the size of Switzerland every year, or approximately 41 000 square kilometres. The United Nations Environment Programme (UNEP) is also on record as saying the African continent loses over four million hectares (9.9 million acres) of natural forest annually, which is twice the world’s average deforestation rate. And deforestation, according to UNEP, accounts for at least one-fifth of all carbon emissions globally. The dangerous pace of deforestation has triggered a market-based solution using bamboo, a fast-growing woody grass that grows chiefly in the tropics. EcoPlanet Bamboo, a multinational company, has been expanding its operations in Africa while it promotes the industrialisation of bamboo as an environmentally attractive alternative fibre for timber manufacturing industries that currently rely on the harvesting of natural forests for their raw resource. The company’s operations extend to South Africa, Ghana and Nicaragua. For EcoPlanet and some African environmentalists, commercially-grown bamboo could help reverse the effects of deforestation and land degradation that has spread harm across the African continent. “If grown in the right way on land that has little value for other uses, and if managed under the right sustainable management system, bamboo can play a role in restoring highly degraded ecosystems and connecting remnant forest patches, while reducing pressure on remaining natural forests,” Troy Wiseman, CEO of EcoPlanet Bamboo, told IPS. Happison Chikova, a Zimbabwean independent environmentalist who holds a Bachelor of Science Honours Degree in Geography and Environmental Studies from the Midlands State University here, agreed. “Bamboo plants help fight climate change because of their capacity to absorb carbon dioxide and act as carbon sinks while the plants can also be used as a source for wood energy, thereby reducing the cutting down of indigenous trees, and also the fact that bamboo can be used to build shelter, reduces deforestation in the communal areas where there is high demand of indigenous trees for building purposes,” Chikova told IPS. But land rights activists are sceptical about their claims. “The idea of bamboo plantations is a good one, but it triggers fear of widespread starvation as poor Africans may be lured into this venture for money and start ditching food crops,” Terry Mutsvanga, an award-winning Zimbabwean human rights activist, told IPS. Mutsvanga’s fears of small sustainable farms losing out to foreign-owned export-driven plantations were echoed by Nnimmo Bassey, a renowned African environmentalist and head of the Health of Mother Earth Foundation, an ecological think-tank and advocacy organisation. “If we agree that forests are places with rich biodiversity, it is clear that a plantation cannot be the same as a forest,” added Bassey. Currently, bamboo is widely grown in Africa by small farmers for multiple uses. The Mount Selinda Women’s Bamboo Association, an environmental lobby group in Chipinge, Zimbabwe’s eastern border town, for example, received funding from the International Fund for Agricultural Development (IFAD) through the Livelihood and Economic Development Programme in order to create sustainable rural livelihoods and enterprises by using bamboo resources. Further, notes IFAD, bamboo contributes to rural poverty reduction, empowers women and can be processed into boats, kitchen utensils, incense sticks, charcoal and footwear. It also provides food and nutrition security as food and animal feed. Currently, EcoPlanet Bamboo’s footprint in Africa includes 5,000 acres in Ghana in a public-private partnership to develop commercial bamboo plantations. 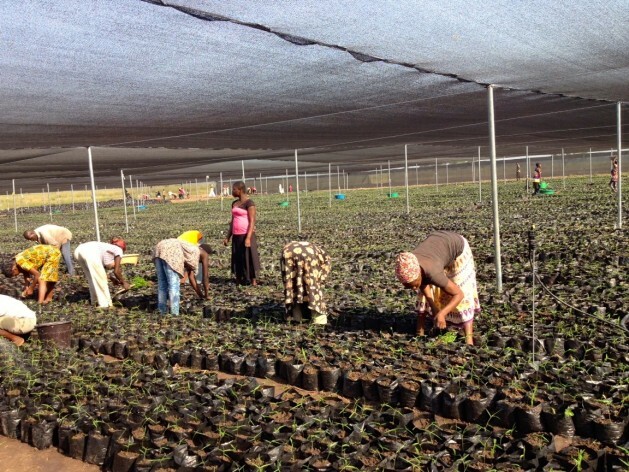 In South Africa’s Eastern Cape, certification is under way to convert out of production pineapple plantations to bamboo plantations for the production of activated carbon and bio-charcoal to be sold to local and export markets. Environmentalist Bassey worries whether all these acres were unutilised, as the company claims. “Commercial bamboo, which will replace natural wood forests and may require hundreds of hectares of land space, may not be so good for peasant farmers in Africa,” Bassey said. EcoPlanet Bamboo, however, insists it does not convert or plant on any land that could compete with food security. “(We) convert degraded land into certified bamboo plantations into diverse, thriving ecosystems, that can provide fibre on an annual basis, and yet maintain their ecological integrity,” said Wiseman. Wiseman’s claim, however, did not move long-time activist Bassey and one-time winner of the Right Livelihood Prize, an alternative to the Nobel Peace Prize, who questioned foreign ownership of Africa’s resources as not always to Africa’s benefit. The study indicates that bamboo plantations have great potential in Africa’s Industrialization as an alternative substitute for timber and energy sector. Enhance the need to invest in bamboo farming.